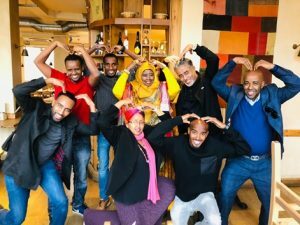 In October, 2018, a major Somali cultural event took place in London— the 10th anniversary of the Somali Week Festival (SWF). Many Somalis came from different parts of the world to be part of the event. Somali poets, artists, musicians, writers, youth, elderly, men and women all congregated to celebrate Somali culture and listen to various literary figures who gave speeches or recited their poetry. It was a historical cultural celebration, and the 10-day event did not disappoint those who attended or followed it through its live broadcast. A picture of some of the guests of the SWF and London-based artists and journalists. In the early years, there was a widespread conception among some Somalis that the Somali Week Festival was an event specifically geared to Somalilanders. I have had the honor of attending the festival for the past few years, and I can attest to the amazing progress that has been made year after year. The event has been an inclusive gathering for all Somalis regardless of their geographical background. There is room for all Somalis to participate and share their work. Ayan Mohamoud, the founder and organizer of the event, has shown exceptional leadership and vision by incorporating all types of Somalis into the program, people who are more interested in culture and the arts and less in what divides Somalis the most—politics. Sharing the same culture and appreciating it has always been the theme of the festival. 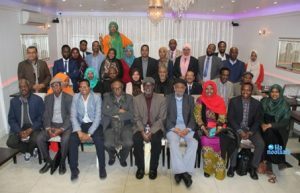 Among those who attended the event were nominal figures in Somali literature and the arts: Saciid Salah Ahmed , Hibo Nuura , Saciid Jama Hussein , Ahmed Ali Egal, Aar Maanta, Rashid Gadhweyne, Farah Gamuute, Mohamed Yassin “Dheeg” Dacar Ibrahim, Nur Daalac, Asha Luul Mohamoud, Jawaahir Abdalla Farah , Zainab Dahir , Mohamed Mohamoud Abdi “Haykal,” Hamda Hussein, Mohamoud Hersi Guled “Abdi Bashir,” Hanna Ali, and the writer/translator Bowdhari Warsame. Equally impressive were prominent journalists and politicians in attendance such as Raage Omaar, Harun Maruf, and the Somali-Kenyan parliamentarian Yusuf Hassan. Other non-Somali scholars and figures included Michael Orwin, Bill Herbert, Clare Pollard, Helen Pinkett, Will Harris, and Joanne Lewis. One of the panels had Michael Orwin, Yusuf Sheikh Omar, Hodon Musa, and Jama Muse Jama discussing the future of Somali studies. Jama, the Director of the Hargeisa Book Fair who was elected in the summer of 2018 as the Chairman of the Somali Studies Association, and his co-panelists gave robust presentation about the efforts being made in supporting and acknowledging the latest research in the Horn of Africa and especially Somali studies. The SWF managed to blend both Somali and English as one night, the program was in Somali, and the following night in English. There were nights when both languages were used. The idea of having the programs in English was crucial because it attracted many young people. Five young Somali poetesses recited their poems in English at an event that was held in collaboration with the British Poetry Center. The talents of these poetesses was on display again, reinforcing the notion that Somalia is still a nation of poets. A new anthology in Somali and English was presented at the festival that chronicled all the poems recited in the program for the last 10 years. For the first time, the SWF introduced British-Somali play, “Arawelo.” The cast was all female, even for roles designated for men. It was a powerful play that addressed Queen Arawelo in ancient Somali folklore, a ruler better known for female empowerment. Hibo Nuura (standing) Faisal Hadi, Mo Farah, one of the co-sponsors of the SWF (kneeling) Lul Araweelo, and Aar Maanta, a regular artist at the SWF. On the last night of the festival, the program was capped by a concert by the famous Somali singer Ahmed Ali Egal and Cherri Hersi, a young hip-hop Somali singer who sings in Swedish and English. The two artists appealed to two distinct audiences—the older generation, who enjoys Somali songs, and the young people who are much attuned to hip-hop and Western music. When Hersi came to the stage, she was deferential to the older generation. “I see a lot of eedooyin (aunts) and adeerro (uncles) in the front rows,” she said. “I want all the young people to come forward.” The youth listened to her and came close to the front rows and the rest was history as she started singing and mingling with the youth. Personally, I had the opportunity to meet and interview legendary figures such as Saciid Salah , Hibo Nuura , and Saciid Jama Hussein . I asked them questions about literature and plays, and, in the case of Hibo , about lending her unwavering support for the Somali Gender Equity Movement’s (SGEM) campaign to elect women in the regional elections in Somalia. The Somali Week Festival was an event that presented a different picture of the Somali people—a picture free from the images of starving people suffering from famine, civil strife, piracy, and religious fanaticism. The festival showcased Somalis proud of their culture and heritage who have made valuable contributions in culture, journalism, arts, writing, poetry, sports, and creativity. It was a memorable event that should make every Somali proud. We Somalis have a lot to offer to the world and to the upcoming generations.